It happened again. Yet another supercar posse has been collectively pulled over for "stunting" on the streets of Ontario, Canada. While last year's incident involved a group of Gumball-style rally participants, a supercar rental tour group was pulled over in Niagara-on-the-Lake this past Wednesday. 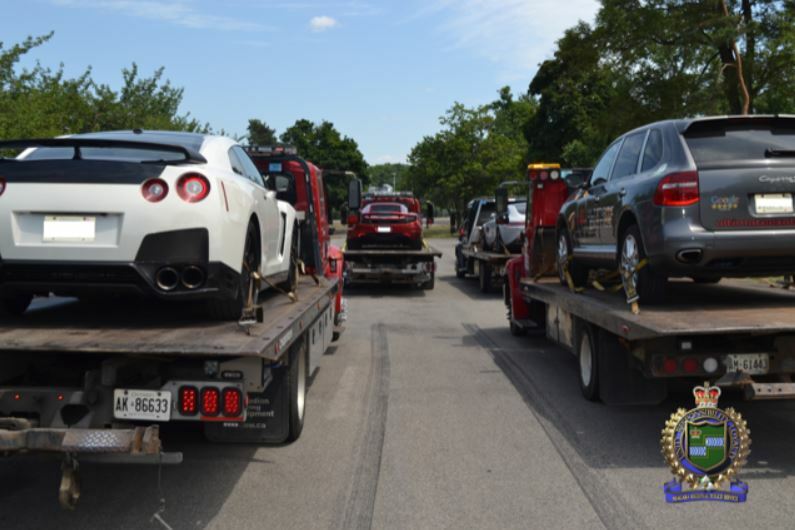 According to Niagara Regional Police, a total of six exotic cars were pulled over in the middle of a five-hour tour hosted by Ultimate Exotics, a company that offers "exotic car experiences" from Stoney Creek to the Niagara Falls area. In response to multiple complaints of dangerous driving from residents, police positioned themselves on a stretch of road that the tour presumably frequents. Lo and behold, the six cars drove into their trap a little too briskly, resulting in multiple charges of stunting, speeding, and one charge of careless driving. A 37-year-old male from Hamilton was driving a grey 2010 Porsche Cayenne and faces four Highway Traffic Act charges, including speeding (77 mph in a 43 mph zone), and stunting. A 58-year-old male from Burlington was driving an orange 2016 Lamborghini and faces one charge of speeding (72 mph in a 43 mph zone) under the Highway Traffic Act. 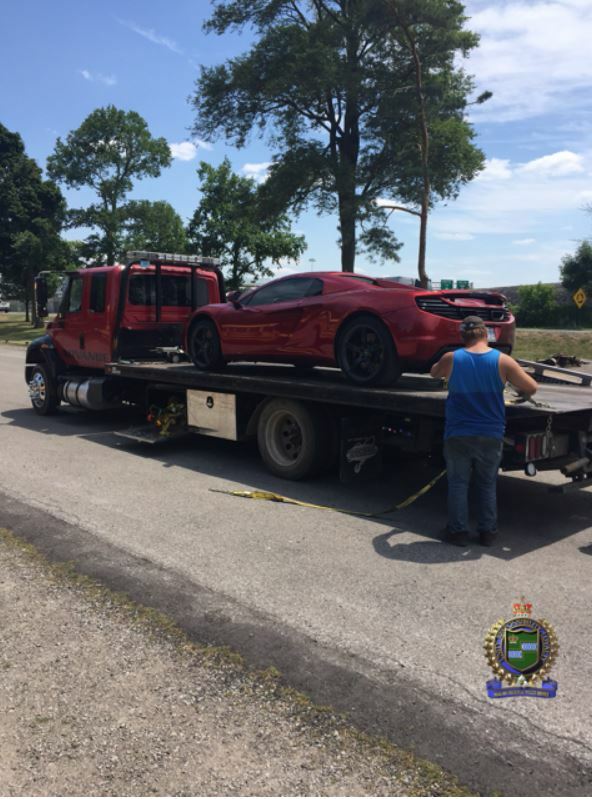 A 25-year-old male from Toronto was driving a red 2014 McLaren [12C] and faces two Highway Traffic Act charges, including speeding (85 mph in a 43 mph zone), and stunting. A 27-year-old female from Oakville was driving a blue 2016 Corvette and faces one charge of careless driving under the Highway Traffic Act. 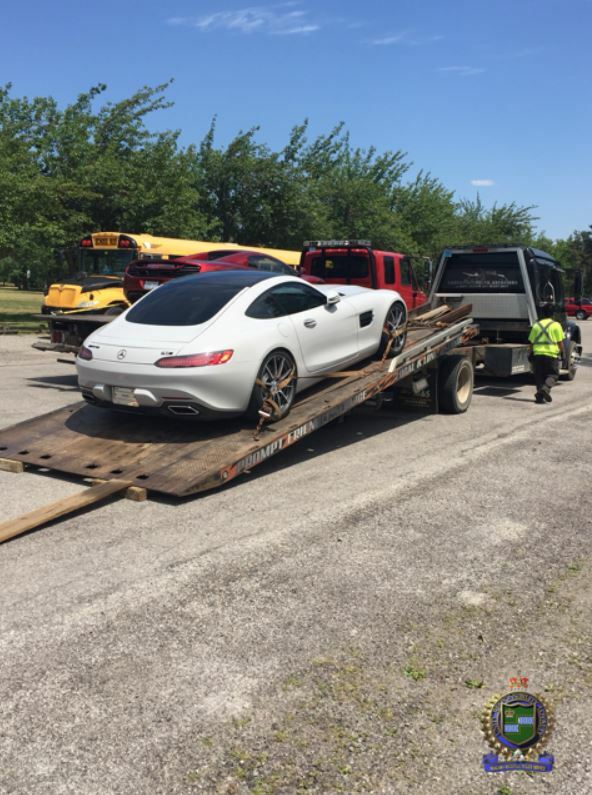 A 48-year-old male from Richmond Hill was driving a white 2016 Mercedes-AMG GT S and faces two Highway Traffic Act charges, including speeding (92 mph in a 43 mph zone), and stunting. A 57-year-old female from Quebec was driving a white 2016 Nissan GT-R and faces 3 Highway Traffic Act charges, including speeding (92 mph in a 43 mph zone) and stunting. Curiously, the man driving the least exotic car of the pack, the Cayenne, and nabbed for doing the second-slowest speed was hit the hardest, racking up four HTA charges. Something tells me this was the "tour operator" who was leading the group, according to police. In the province of Ontario, a stunt driving conviction carries a fine of anywhere from $2,000 to $10,000, up to six months of jail time, and a license suspension of up to two years. Drivers slapped with a ticket for stunt driving or caught going 31 miles per hour (50 km/h) over the speed limit have their licenses taken away on the spot and can only get it back seven days later for a $180 fee at the Ministry of Transportation, according to the CBC. The car is also towed away and impounded for a week even if it's owned by an employer, parent, or rental company...such as Ultimate Exotics. UPDATE: Speaking to The Drive, a general manager at Ultimate Exotics says the group was pulled over on a non-residential service road in Niagara-on-the-Lake that is indeed part of a route that the company has used in the past. Needless to say, the rented Ford Edge didn't get very far.